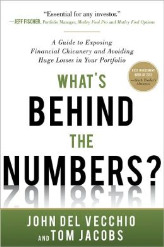 Tom Jacobs in an Investment Advisor managing individual accounts with Dallas's Echelon Investment Management, and co-author of What's Behind the Numbers? A Guide to Exposing Financial Chicanery and Avoiding Huge Losses in Your Portfolio (McGraw-Hill, 2012). He has been investing since 1968, when he and his father bought two shares of Ford. Mindful of his Depression-era parents' stories, Tom practices value investing. Though he covers the range from deep value to special situations, he concentrates on shareholder yield. Nothing makes him giddier than a company offering the dividend-buyback-debt paydown virtuous cycle. A graduate of Cornell University and the University of Chicago Law School, Tom is proof that the worst intentions survive the best institutions. He lives with his future husband in Marfa, TX, where he volunteers teaching personal finance and is a Rotarian. How can we help young people save and invest, when they are hard-wired for risk and immediate return? Seasoned investors should think like buyers of companies, not focus on stock price. Get rich or stay rich? E Today's Craze Or Tomorrow's Calm? All investing falls into two types, and I'll take the second, please. A value-based dividend reinvestment strategy allows a good night's sleep. Is Your Home’s Value At Risk? The online housing value services are blunt hammers. Here's what real estate investors do. Thank you Marcy! My firm will let me use large well-known companies as examples and I will do so from here forward. Please excuse this oversight. As a former teacher, I know the value of real-life examples. Thank you George. I'm a former high school teacher so I like to try to do this. I appreciate your comment. FFNW First Financial Northwest Inc.
NNN National Retail Properties Inc.
NSAM Northstar Asset Management Group Inc. There are always companies gaming revenue to satisfy Street expectations. I learned young in an earlier tech boom. Holding company for investments in management entities of investment funds; investing and personal finance website; misc. other investments. Companies are under more pressure than ever to “beat by a penny,” but you don’t need to be a forensic accountant to uncover where the spin ends and the truth begins. 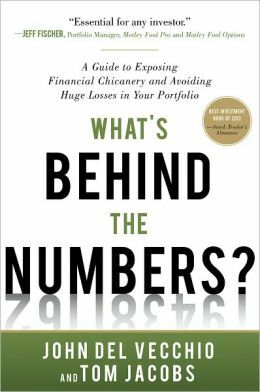 With the help of a powerhouse team of authors, you can avoid losing a chunk of your portfolio when the next overhyped growth stock fails by knowing What’s Behind the Numbers?